Mobile Vehicle Monitoring - Applied Information, Inc. 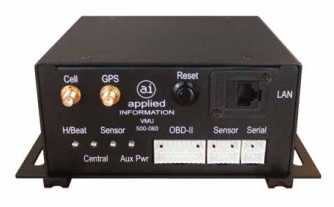 The AI-500-060 series of controllers provides a cost-effective way of integrating and monitoring vehicles. It is designed for extreme temperature applications, has low power requirements, and comes in a variety of configurations supporting all common communication methods. All units come with multiple digital inputs and outputs as well as analog inputs. These inputs can be connected to snow plow blade sensors, auxiliary tank fuel levels, or any digital or analog input that requires monitoring. An RS485 and an RS-232 interface port is standard on the units, which connects to additional devices such as weather sensors, snow plow controllers, and any device with a serial port. An OBD-II interface is standard on these units for monitoring engine parameters. The unit works in conjunction with the Glance Platform, providing optional connectivity to the cloud-based Glance solution. Simply connect the I/O to add monitoring and control to your equipment. Setup is very simple as the device receives all configuration information from the Glance Server and requires no local configuration.